Elastic Wrist Brace, manufactured by FLA Orthopedics, is a lightweight supportive brace that simultaneously delivers gentle compression. This brace is great for immobilizing the wrist joint, to prevent exacerbating injuries during the rehabilitation process, or offering additional support during strenuous activity. Unique to this brace, the Elastic Wrist Brace features a wide, malleable, and removable palmar stay, which allows you to choose your wrist's positioning. This brace, additionally, offers a low profile design that allows for optimal gripping strength and finger dexterity. With this wrist support brace, you can easily apply it with one hand and using uncomplicated hook and loop closures. 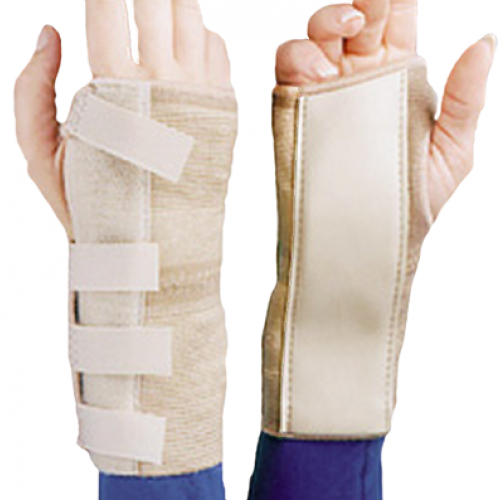 Depending upon your needs, you may select this brace for either the left or right hand. Buy now and prevent exacerbating wrist injuries today! However, if this wrist support brace does not meet your rehabilitative needs, make sure to check out these additional braces, such as this wrist support and wrist splint, here. Immobilizes joint to prevent further injury. Sizes: XS, SM, MD, LG, and XL; left and right hand. Application: To immobilize the wrist during rehabilitation. Product Numbers: 22-2001SSTD, 22-200SMSTD, 22-200MDSTD, 22-200LGSTD, 22-2001LSTD, 22-2011SSTD, 22-201SMSTD, 22-201MDSTD, 22-201LGSTD, and 22-2011LSTD. To properly measure which size you need, measure the circumference around your wrist.